always so tense. we could call him "stands with a fist" and pay homage to dances with wolves... but we don't. we call him asher. and i call him buddy, because he is... my buddy. his ears are kind of elvish. then i remembered that donna said she got good pictures of him while she was holding him. so i picked him up. such a sweet expression... but his ear is the only thing in focus. not crying, not pooping, just making faces. he makes faces like his auntie emma. she makes great faces. it is her gift. i am bad at hiding my fingers behind his head... but that sure is a sweet baby. oh my... and here is where i need your help. Love this post! It should be a weekly...daily feature. "Oh my! Naked neighbor raking leaves!" You are so right about Emma. wendy lou... with me as his mother, he is sure to think and say that a lot! courtney... he DOES look like a cuppie doll in that picture! that is hilarious. whatchu talking about? like Gary Coleman. 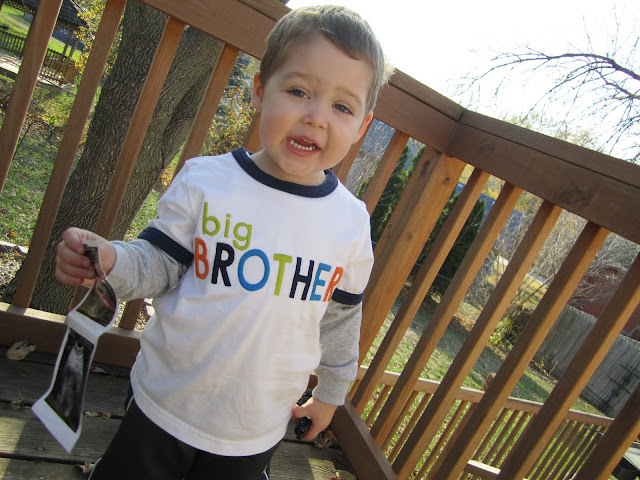 He is just adorable and I am so happy for your family and the Grandparents Boucher! kris... that is great advice! When can I come pick him up?? He is beautiful. Asher's faces just make me laugh, what a cutie! Maybe he will be a comedian when he grows up or at least tell really funny stories with faces to match. He looks like he is looking in a mirror and astonished that he is so adorable!!! Can't wait to kiss those cheeks!